TAKE ONE LOOK at the Abel product offering displayed in all of its glory at a trade show and you’d be hard pressed to come up with a category they’ve missed. With last year’s ownership transition behind them, the company seems to just get more confident in their craftsmanship, as evidenced by their decision to reintroduce the original Abel 2 in a 20-year anniversary edition. Mind you, many of the original Abel 2s are still getting hard duty. In addition, Abel has some brand new designs for 2008: the Bass Super 8, the Super 12 Wide, and the Super 12X Extra Large Arbor Rapid Retrieve. The Bass Super 8 is a custom-colored and -finished limited edition inspired by James Prosek’s very nice artwork. The Super 12 variations are meant for much larger fish, of course, with the Extra Large Arbor Retrieve designed for very fast line retrieval on 11- and 12-weights and Gel Spun backing. The Super 12X Extra Large Arbor targets tarpon, large tuna, giant dorado, sailfish, wahoo and other saltwater speedsters, and exemplifies Abel’s strengths in building the big stuff as well as it can be done. This season Tibor introduces a new handle system designed to aid anglers in rapid line retrieval. The new SpeedHandle design shifts the second handle from the outer rim of the spool, making spool rotation with a slack line easier. Sounds simple, but it works; Tibor claims that it speeds up line-retrieval by one-third. The new handle system, designed for new Tibor and Tibor QC reels and spools, cannot be retrofitted, but it is available on new spools for pre-2008-model reels. The company is also putting some new marketing effort behind their LineMaster line management device ($245), a multi-function tool designed to ease the pain of fly line storage, spooling and removal. Redington wants to please the value-conscious with its new Red.Fly2 Series reel. The $80 large arbor reel is constructed of high-density graphite composite spool in an aluminum frame, Rulon drag, an clutch system that makes the reel easily convertible from right- to left-hand retrieve. The company is also offering a new color option, moss, for its popular cork-drag CD series reel ($119-149). Redington is making a push with their low-cost rod/reel/line outfits next year, and they think consumers will like the shuffling of rod and reel colors to match one another. 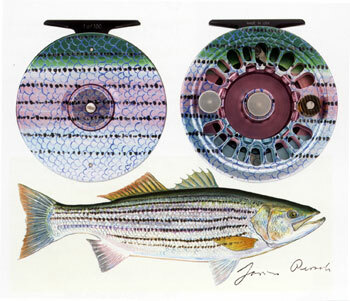 Orvis has redesigned their Battenkill Large Arbor trout reels for 2008. They’re 20% lighter than they were last year, as first introduced, have improved backing capacities, and feature a high-performance center disc drag system. Available in January, the reels will be priced at between $179 and $198 depending on size. Ross Reels introduced their new Flow model ($299) at the FFR show this year. 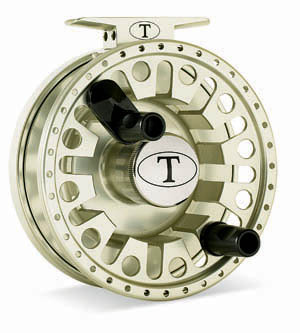 Ross calls it a “modern rendition of the centerpin reel,” incorporating a quick-release spool, a smooth-moving cam lever to engage or disengage the clicker drag, and a unique spool design that eliminates the need to re-spool line when the reel is converted from right- to left-hand retrieve. Snowbee USA has a new smaller #340 reel to add to its XS Large Arbor fly reel line. A new affordable reel from Waterworks-Lamson made a splash at FFR ’07. 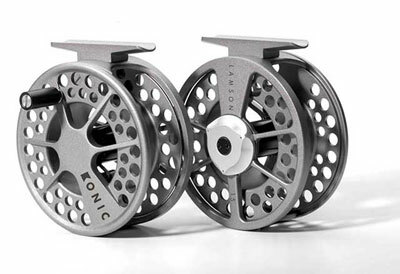 The new Konic reel uses the same fully sealed conical drag system that is used in Lamson’s more expensive reels, but delivers it at $119. The new reel uses pressure-cast ACLDC12 aluminum for both the frame and spool, and Lamson coats it with polyurethane for added abrasion-resistance.